Idearium is the premiere interaction design online magazine in Italy; since year 2001 the site has gathered a strong community of designers, usability experts, managers, programmers and smart people and it has its derivations in the Interaction Frontiers event organized by your truly and Leeander (the founder of Idearium). 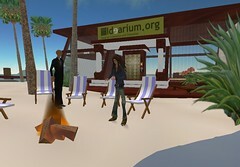 In its 6th year Idearium comes with a brand new site and a whole innovative SecondLife presence on a nice islet with all the things you need to spend some good time among friends. The islet will be properly open during Turin Barcamp 06, just click on this SLurl and join the party. This entry was posted in Beef and tagged blog, second life, user experience by admin. Bookmark the permalink.